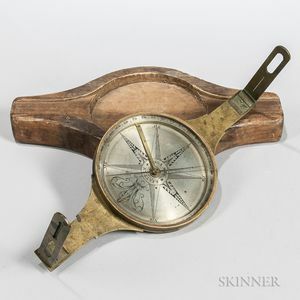 Richard Patent Surveyor's Compass, New York, 19th century, 5-in. engraved silvered dial reading "R. Patten New York," eight-point rose, fleur-de-lis representing north, blued-steel needle and brass lifter, screw-mount sights, housed in its original fitted pine case, lg. 13 3/4 in.